A great place to base yourself from when visiting Porirua / Wellington. Based on Mana Esplanade you are very handy to 2 train stations, a 3 minute driveway to the stunning sea side village of Plimmerton, and across the road from the beautiful Pauhatanui Inlet, where you can take in some lovely walks. The recently renovated apartment also backs onto the Ngatitoa Domain and the Mana Marina is just a 5 minute walk away as well. Great if you are sailing into Mana! We have many choices of local cafes, bars, beaches, awesome parks for the young kids, a new skate park in Plimmerton. There are many attractions and activities available in the local area including: Ngatitoa Domain, Pataka Museum of Arts and Culture, sailing and fishing tours, two 18 hole golf courses, mini golf, The Adrenalin Forest, the Dialled In indoor trampoline park, strike bowling entertainment, go carting and cinemas. The Police College is just up the road, and we are 5 minutes from the Whiteria Polytechnic if you are visiting for your a special gradution. You are 5 mins away from North City Plaza to go shopping and get grocery's from the New World in Mana. 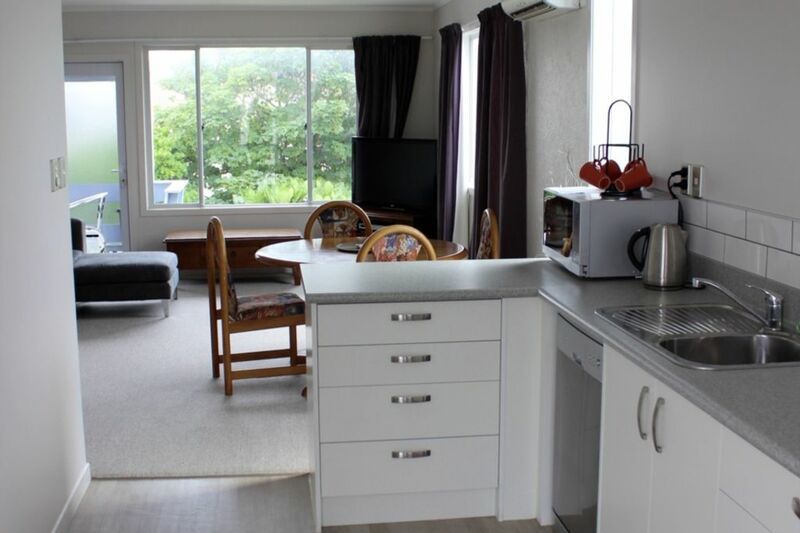 The apartment is just on State Highway 1 which allows for easy access south to Wellington city centre within 30 minutes, or north towards the Kapiti Coast and across the Haywards to Lower or Upper Hutt being only a 25 minute drive away. The AIrport is 35 mins away, and the Ferry Terminal 20 mins drive. This is a wonderful apartment to relax, and enjoy some of the great attractions the Porirua / Wellington region has to offer. Especially great if you want to go to a concert in the City or go straight to the Westpac Stadium for the rugby or the Sevens, as the train is just a 5 minute walk away. Please note, NO parties to be held at the Unit and we ask you to please be respectful of the other tenants / owners in Apartment building. Nice and clean. Great location and handy to train station. Was pleasantly surprised that there was no road noise even though it is located on a main highway. Location convenient. Floor was sticky on arrival. At night there was a dull knocking sound from a neighbours device ? Heat pump.